Tableau’s new tool, Ask Data, is a natural language processor that allows users to ask questions in plain language and get answers about their data in the form of a visualization. 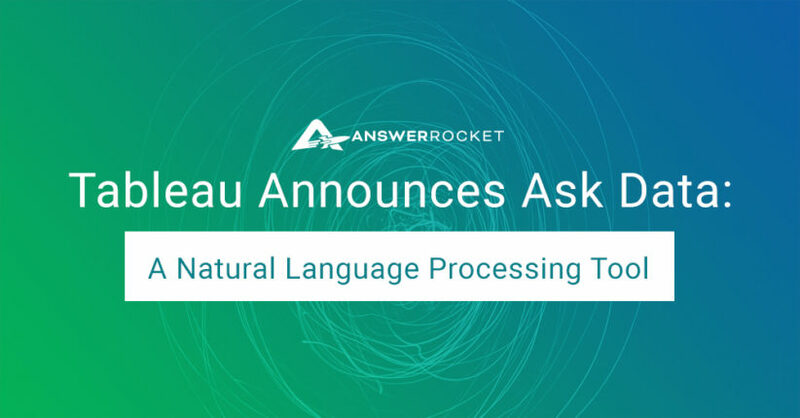 This kind of natural language processing is something we’re very familiar with at AnswerRocket, and we’re excited to jump into the conversation that’s been generated in the aftermath of Ask Data’s arrival. So what exactly is the natural language processing that Tableau’s Ask Data has us talking about? The first example depends on keywords. The second depends on a person’s intention. For businesses who want analytics platforms with accessible AI, this difference is key. We suspect you’ll see more natural language tools in the future, and historical natural language processors will continue to advance. When it comes to selecting a solution or engaging with the conversation around these tools, it’s important to understand what natural language processing means in the context of business. So let’s talk about why natural language is important and what questions to ask when you’re considering a platform. People don’t think in keywords. Stringing together a list of disconnected keywords disrupts workflow. When you have a question at front-of-mind, it’s distracting to translate what you know you want to ask into parsed language. Plus, keywords rely on specific data structures and dimensions. Look for a natural language search that allows business users to build a glossary of terms and synonyms so that employees can ask questions like humans. When we ask questions, we rely on business vernacular and use phrases like “compare” to signal the need for ratios and percentages. A good natural language processor should fill in the gaps and build calculations around our intended meanings. As such, natural language tools allow you to focus all of your brainpower on the answers you receive so that you can more quickly set business strategy. The search engines we access in our daily lives depend on natural language. Why should our business tools be any different? To be clear, it’s not just about convenience; it’s about increasing access to analytics for the non-technical user. This accessibility of natural language makes it easier for business people to use these tools and feel confident in the answers they’re getting — because they’re asking questions that make sense. The extension of asking “what” questions is getting to the “why.” As we said before, natural language is about understanding a person’s intention. A great natural language tool should enable customers to ask “why are sales down” and “how can we grow our brand” — questions that business people ask all the time. AI empowers people to ask these day-to-day questions and get answers in seconds. Natural language paves the way for better AI. Perhaps most importantly, natural language connects people to the most advanced versions of AI-powered analytics; in fact, the more these algorithms develop, the more vital natural language becomes. First, let’s establish some context. The full implications of AI in business are beginning to emerge as more companies look to implement machine learning into their BI tools. Ask Data has arrived on the cusp of AI-driven tech trends in industries such as the consumer goods and retail space (just look at resources like Consumer Goods Technology, which details how CPGs implement AI to respond to radical market changes). As such, technology that prioritizes organic communication is well-poised to snowball in industries that are hungry for more automation, and as more businesses invest in these technologies, the more these technologies can develop and grow. Plus, the better we can communicate with these future-facing tools, the better we can leverage their knowledge and implement them into business strategy. It’s easy to think of AI as a separate robot entity in your computer, but AI that works from natural language is more akin to a fast, efficient data scientist that you can access at any time. So sure, a robot, but one that you can talk to like a person. We think that more people valuing natural language in their AI tools is a great thing because it opens the door to even more advancements that help people get what they actually need. In our case, it’s answers to tough questions. And we’re happy to provide. For more advice on shopping for business intelligence software with natural language processing, check out our complete guide to choosing a self-service analytics tool.